Maya Apocalypse: December 21, 2012 doomsday prophecy isn’t the first. 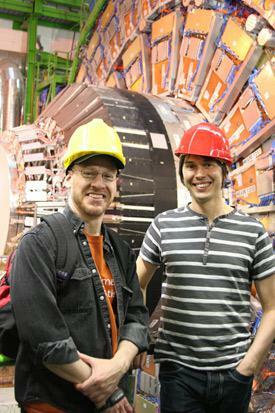 Professor Brian Cox (right) and Phil Plait (left, with the extra tall hardhat) trying to make black holes at CERN. Worried about the Maya Notpocalypse™ tomorrow? You shouldn’t be. As I’ve shown over and over and over and over again, it’s all nonsense. The Maya calendar didn’t end, the predictions made by people are scientific piffle, and even if the claims were true (like a planetary alignment, or a rogue planet, or the Sun aligning with a black hole) they wouldn’t hurt us anyway. And the thing is, this isn’t even the first doomsday prophecy based on nonsense. Remember Planet X in 2003? The planetary alignment in 2000? Or asteroid TU 24? No? Of course you don’t remember those. They were all spun out of thin air and evaporated as soon as their dates came and went. How about this one: The Large Hadron Collider was going to create a black hole and kill us all! That one made the rounds a few years back, and a couple of crackpots even tried to sue to get it shut down (in case you think me maligning them by using the word “crackpots,” I’ll note they sued the United States, when the LHC is run by CERN, a European consortium. That is not the action of a fully intact pot). If that doesn’t convince you, perhaps this extremely useful site will: Has The Large Hadron Collider Destroyed the World Yet? Of course, there’s always this, and even this. Still and all, remember: Doomsday prophecies come, and doomsday prophecies go. If you want the real scoop on how the world will end, read my book Death from the Skies! If you want my guess, we have probably six billion years or so left before the Sun swells into a red giant and fries the Earth (or, if you want to pick nits, a few hundred million years before the increasingly-warmer Sun turns the Earth into a replica of superhot Venus). So there’s that. My point? Have a nice Notpocalypse™! It won’t be the last.